Click here for the text of the article. The 9th SEAL (Society for Effective Affective Learning) Conference takes place at The King's School, Canterbury, Kent, UK from 29 March to 1/2 April 2001. This includes a talk by Andrew Nicholas entitled "Vedic Maths - India's System of Mental Mathematics". Andrew Nicholas has also written an interesting article for the SEAL Journal entitled "Vedic Maths, Introducing India's system of mental mathematics and its founder, Tirthaji". This is in the December 2000 issue, pages 21, 22. 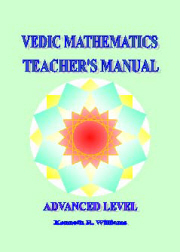 Edinboro University of PA in the United States includes Vedic Mathematics as part of a course. The professor teaching the course is Frank Marzano. Jain in Australia has also written some books and here is a quote from a recent email received from him. THE BOOK OF MAGIC SQUARES, Volume 3, cost= $33). This is a rare indepth visual study of the Vedic Square making a rare connection to how the matrix of single digits from 1 to 9 expose a hidden secret to nuclear geometries. This is exactly what I have been teaching, via theatre, in Australia schools during the last decade as an Authorized School Performer. I also teach this Mathematical Mystery to adults in weekend seminars. Many acclaimed scientists that I have met are amazed how The vedic Square reveals Atomic Crystalline Art. Its like, through the artistic expression of Magic Squares and Vedic Squares I have entered into the world of Atomic Physics THROUGH THE BACK DOOR, linking the scientist's realm with the artist/mathematican's realm. I would be interested to know how much you know about this aspect of the Vedic Square and if any other publications exist regarding the atomic-art-revelation. As far as I have researched, my books on Magic Square Atomic Artforms and Vedic Square Atomic Artforms are totally original and unique. The two courses advertised in the recent Newsflash are now running in Manchester, England with many interested participants. You may be aware of the neat method of multiplying numbers like 74 x 76 where the first digits are the same and the last digits add up to 10. You multiply the 7 here by the number "One More", which is 8. So 7x8=56 is the left part of the answer. And then multiply the last by the last to get 4x6=24 as the last part of the answer. This gives 74 x 76 = 5624. One of the course members pointed out a variation of this which we have not seen before. Johnathan Cashdan suggested applying the method to products like 6(1/3) x 6(2/3). That is, six and one third times six and two thirds. Here the left part is the same (6) and the last parts add up to 1 (1/3 + 2/3). So the method applies and 6(1/3) x 6(2/3) = 42(2/9). Very nice! More workshops are being organised in India. There are some in Goa at the International Centre from March 21st to 23rd. Following on from previous discussion Barbara Salmon has pointed out that there is an example of writing with the least significant digit on the left in the original Vedic Mathematics book by Sri Bharati Krsna Tirthaji. Ch 35 Cube Roots of Exact Cubes, Algebraic Principle Used - p319. a + 10b + 100c + 1000d etc. Note: If one wishes to proceed in the reverse direction, one may do so; and for the sake of facility's the letters substituted (for a, b, c, d etc.) may be conveniently put down as L,K,J,H etc." [he then goes on to demonstrate - using L, K, J, H etc]. 11: Is Knowledge Essentially Simple?